The door to Gotham’s deli is a magical portal. Upon stepping through it you are immediately transported from a sunny, warm sidewalk in Downtown Smithfield, NC to a cool, vibrant New York City deli, just like the sort you’d find on the corner or your favorite borough. 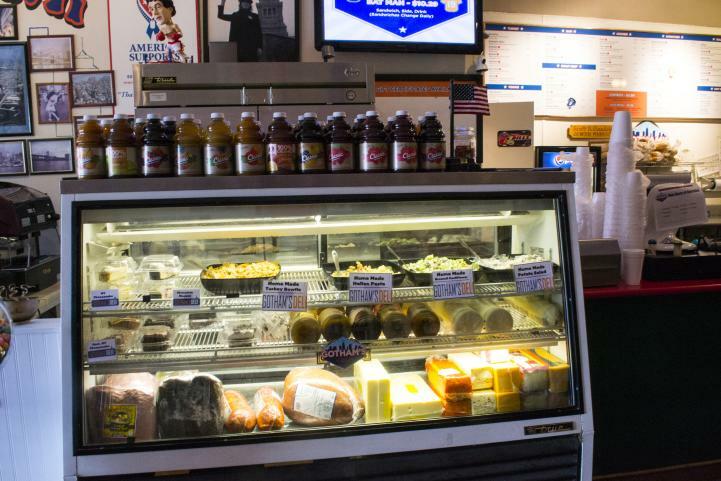 The flags of every major New York sports team hang from the ceiling, memorabilia cover the walls, and a deli case full of meats, cheeses, and daily-made pasta and potato salads great you. Gotham’s has been around since 2003, back then it was called Gandolfo’s. It’s owned by Scott Gandolph and his wife Lisa. Scott was born and raised on the east coast of Long Island and has a long history working in the restaurant business. Eventually, his work brought him to Smithfield and he stayed. 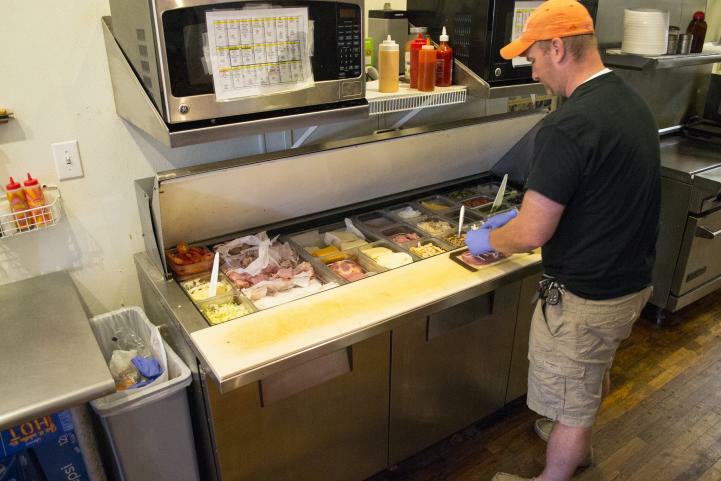 “I wanted to bring a New York style deli to the South,” said Scott when I sat down with him a mere week or so after being proclaimed North Carolina’s Best Deli by Best Things North Carolina, an online publication. Scott must be doing something right. 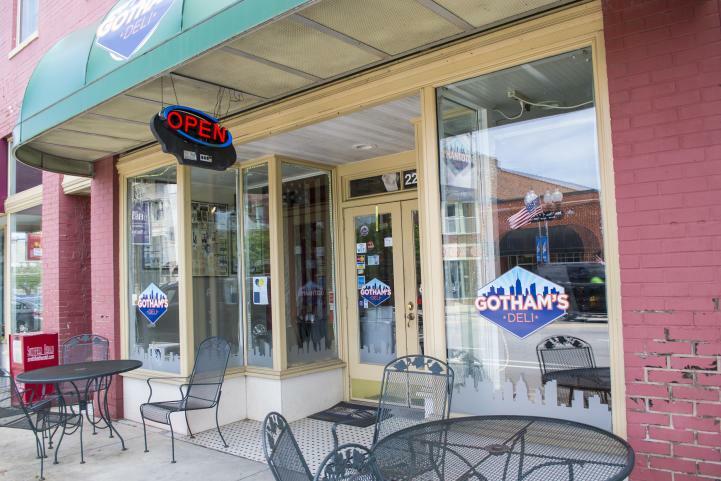 Gotham’s is a local favorite with regulars in the deli and also a booming catering business. The deli is just a few miles off I-95, Exit 95. While I was talking to Scott a group came in from New York, one that’s been a permanent JoCo resident for 8 years and two that were visiting her. They’re all long-time fans of Gotham’s and they commented that it’s the most authentic New York deli they’ve encountered outside of, well, New York. “If a Northerner can come into Gotham’s and eat here and say it felt and tasted authentic, that’s a compliment to me. We have travelers from up north stop in every time they’re in town.” Scott makes sure he’s serving up the whole package too. It’s not just the food. Everywhere you look in Gotham’s you’ll see New York. Scott has signed photographs of famous New Yorkers and recognizable buildings and landscapes. T-shirts and poster that pay homage to the New York fire and police departments, as well as the World Trade Towers, fill the walls. Towards the back, mementos of Downtown Smithfield remind people filling up their drink cup or grabbing their chips that they’re in North Carolina. There’s a picture of famous local Ava Gardner. According to Scott a lot of the stuff came from his own collection, “I always joke that the happiest day of my wife’s life was the day I bought the restaurant because I moved this entire collection out of our house.” Some of the pieces have come from customers like one who was a Buffalo Bills season ticket holder for 23 years. 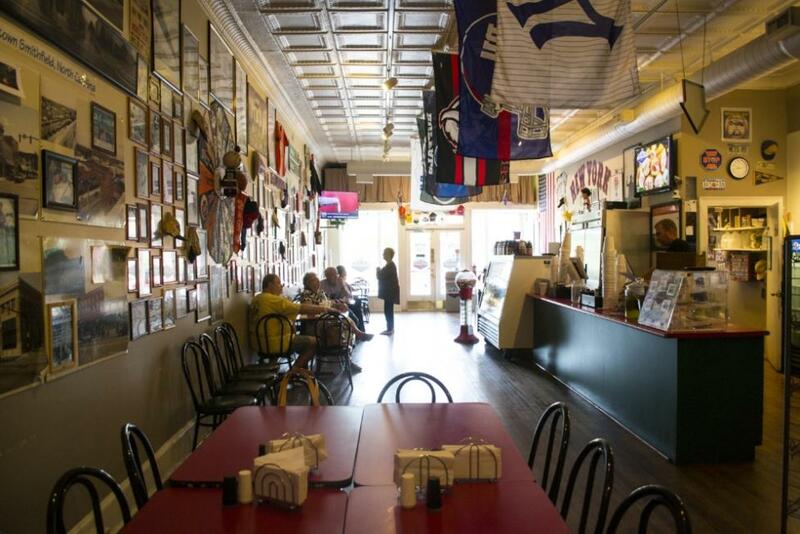 The Smithfield memorabilia came from the Downtown Smithfield Development people and the Ava Gardner Museum, located just a block from the deli. If you’re feeling adventurous ask for the Batboy or the Batman sandwich. They are sandwich combos that change daily. One day the Batboy might be the Brooklyn Bridge sandwich and one day it might be the Bauer Ave. It’s like playing the sandwich lottery. Adventurous or not, everyone loves a good, fresh-made sandwich. 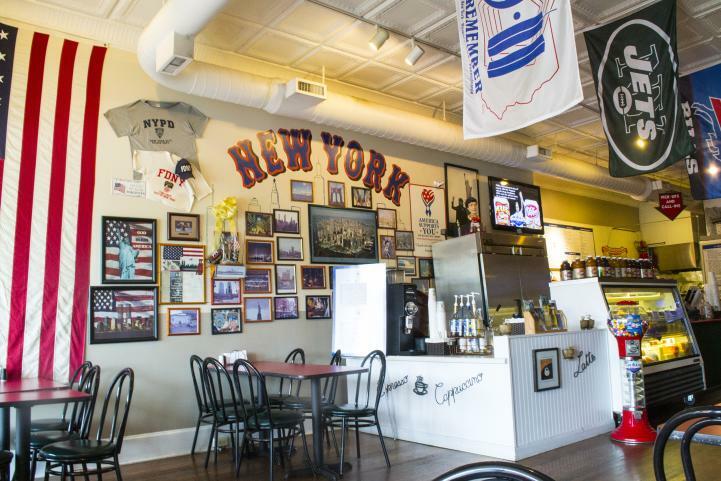 Anytime you’re in Smithfield or driving I-95 near Exit 95, stop in at a locally-owned, delicious bit of New York in North Carolina. For more information about Gotham’s visit their website at gothamsdeli.com and also Like their Facebook page.